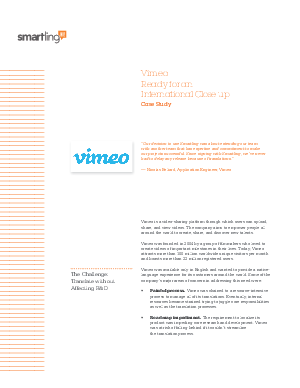 Create a simplified process through Smartling’s enterprise-grade API, allowing the Vimeo team to upload and download files in a way that integrates with its development process and infrastructure. Execute the project with no strain on internal resources thanks to Smartling’s automated system that removes the burden of project management from Vimeo’s tech team. Eliminate any delays in the translation of new content as Smartling’s platform delivers localized content rapidly with no developer involvement required. Download this case study to learn about how Smartling’s translation software platform can simplify and accelerate your translation projects and enable your business to reach new markets quickly.